I don’t know what it is but I’ve noticed that several of my friends who love fantasy, also knit. I seem to be the oddball out of my female friends since I wouldn’t even know how to hold a pair of knitting needles or even make a single loop. I know many of them talk about Dr. Who and knit in their book clubs. When I heard there was a new series of books involving a fantasy world and knitting, I knew I had to try it out for my friends. Once The Broken Circle: Yarns of the Knitting Witches arrived in my mailbox I was excited to start reading! The Broken Circle is an innovative story designed just for knitters and people who may be interested in knitting. This fun fantasy themed book revolves around 12 knitting witches, and their quest to find a stolen crystal taken by one of them who went traitor. Each of these ‘yarns’ has a knitting theme and also an interesting knitting pattern included after each story. 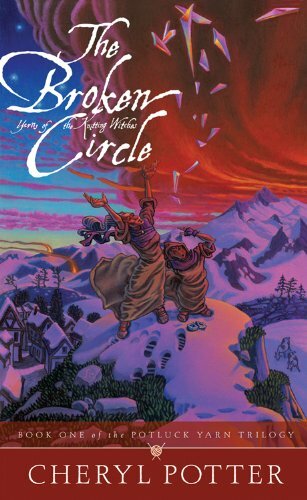 I will honestly say I have never seen a book like The Broken Circle. This book is divided into different short ‘yarns’ all of which introduce young adults to the fantasy genre. As someone who knows nothing about knitting, I have to admit that I felt a bit lost more than once in the book. What is really cool, however, is that along with the tales, you also get knitting patterns, allowing beginning knitters to make fun projects relating to the story. As someone who enjoys fantasy, I thought this was a fairly cute concept. While I am not a knitter, I have many friend who would love to read this book themselves or give it to a family member who loves to knit. My only warning is that the book is fairly long for a young adult book, so make sure that whoever receives this book does like to read since it may take them awhile to finish all the little stories. Based on my own experience reading this book, I am happy to give The Broken Circle an A- rating. Have a teenager in your family that is interested in learning how to knit? How about reading about different fantasy worlds? If so, we think they will love The Broken Circle: Yarns of the Knitting Witches. You can currently purchase this fun book on Amazon.com for under $12 in a paperback, or under $10 if you are willing to read the Kindle format. Since it is really two books in one with the knitting patterns, it truly is the perfect gift for young knitters! I never learned how to knit however my Grandmother is an avid knitter and has made us all sweaters and scarves and a million other things. She is also an avid reader so I think this book will be perfect for her. I used to knit long ago. I made my brother a sweater that ended up being too big. I usually crochet not. Want to start knitting again soon.